This is a great toy deal, get 40% off select Melissa and Doug wooden toys! With Melissa and Doug wooden toys. you can host a pizza or birthday party! 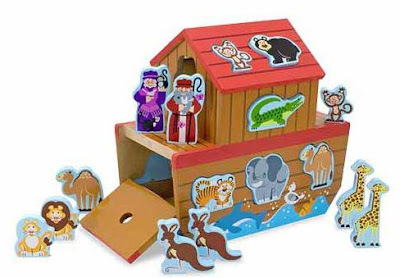 Watch the animals board Noah's Ark 2 by 2! Hammer that wooden pounding toy! Save a bundle during this sale! Click here for the sale at www.LeBabyShop.com. Shipping starts at $7.99 for a $25 purchase. If you are in the Plaza Pointe-Claire area in Quebec, visit their store at 275-3 Boul. St-Jean. 0 Response to "40% Off Select Melissa & Doug Toys at Le Baby Shop"